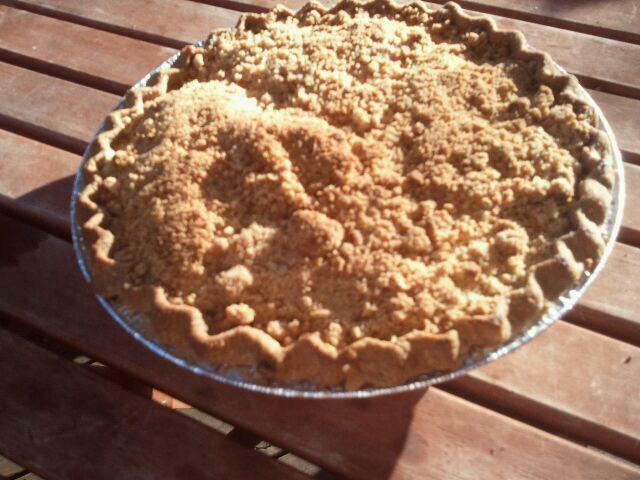 As I was preparing this pie I let my mind wander and think about who was to receive it. The person who came to mind was a lady I haven’t seen in a while but who has been on my mind nonetheless. It feels like I have known this woman for a long time but I realized that I didn’t really know a lot about her. My instincts told me that she was a tender soul and that she cared a lot about people. Over the last few years I had noticed that this woman was helping a family I knew that had experienced some difficulties. She offered them her time and her love to help them through a very challenging period. What an amazing gift. This spring this remarkable woman lost her son. Loss is hard – and there are no easy answers. Losing a child is something we never want to experience – and I think most parents would choose to give up their own lives to save their child. But life does not work that way. We are not in control. I shared with her the words I’d heard from a pastor many years ago after a young girl had died: He said that when Jesus learned that his friend had died, Jesus wept. To me there is comfort in knowing that even Jesus could be moved to tears at the loss of a friend. We can’t rewrite events, even though we might want to. We may feel sadness for our friend’s loss all the while knowing that we are powerless to “fix” things. But we can still be present; we can offer our love and support. Today I brought my apple pie to this lovely lady and her husband. As we sat and visited for more than an hour, we talked about a great many things. At one point she shared that while you never really get over losing someone, you may one day find that you accept the mystery and the majesty of life. This lady is truly a remarkable woman and I am honored to know her.